Discover your future career. Lead yourself through the career decision-making process with all the information and resources you need. 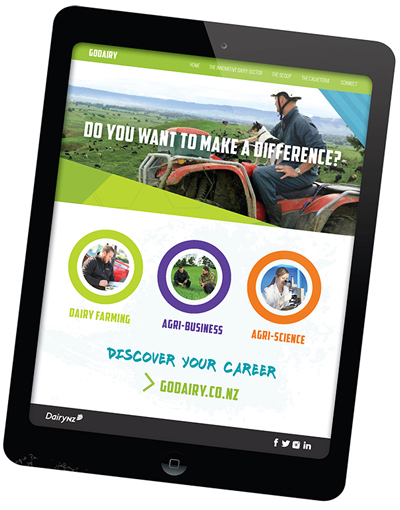 Discover your future career doing something that matters in agri-business, agri-science or on farm. Do you love technology and being innovative? How about working with animals and outdoors? Do you strive to learn new skills and find solutions? What about travelling, giving advice, and meeting others in the primary industries? You can run your own business, help others and be challenged every day. Grow Your Future With Dairying will point you in all the right directions. Take the quiz to reveal possible workplaces and jobs suited to your likes, wants and needs. Map your career pathway to find training and study options. Hear from other like-minded people with tips, and follow the links to essential resources and social media. Discover where you can make a difference and find your place in the world. If you want to earn good money and make a lasting contribution, then download your copy. A career is waiting for you in the dairy industry.